He’s drawn Steve Jobs as Wolverine, Cyclops, Batman and Little Nemo. And Robert Sikoryak has cast Donald Trump as Solomon Grundy, the Joker, and Titano the Super-Ape, too. You can ask him about his hilariously detailed work right here. Robert Sikoryak’s been making subversively clever sequential art for a long time. He started his professional career at Raw, the seminal alternative comics magazine edited by Art Spiegelman and Francoise Mouly, and has contributed illustrations to The New Yorker, GQ, and The Daily Show with Jon Stewart. Sikoryak’s won some of comics’ highest awards, including the Harvey for Masterpiece Comics, which represented the works of Shakespeare and other literary classics as superhero sagas and bubblegum-wrapper gag strips. 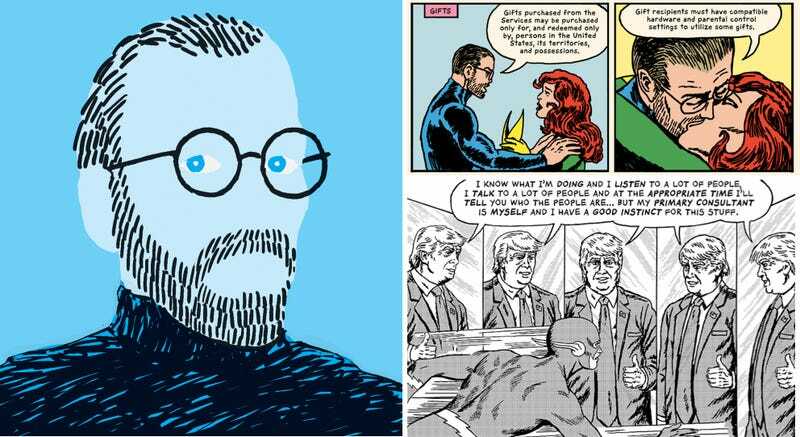 His newest published work, Terms & Conditions, turns the iTunes User Agreement into an epic journey through comics’ aesthetic history, riffing off classic pages from Marvel Comics and beloved newspaper strips from the funny pages. Sikoryak’s also been lampooning the current President of the United States with his Unquotable Trump project, which will be collected into book form by Drawn & Quarterly this November. He’ll be here to answer your questions about his work from 1 p.m. to 2 p.m. ET.